Come enjoy San Diego with us! We are excited to announce our brand new program which lets you see San Diego through the eyes of its locals! 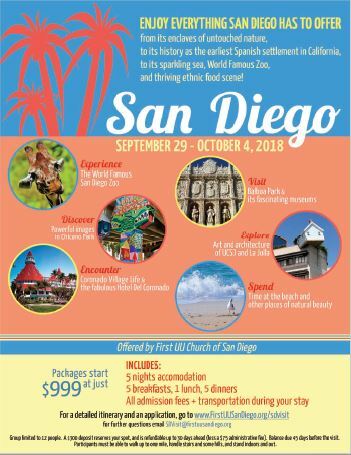 For one low package price you can spend an unforgettable time, immersing yourself through some of San Diego’s most beloved attractions – all the while enjoying the company of like-minded UU’s. Get the inside story on our history and hidden favorites, as well as experiencing our World Famous Zoo and our lovely beaches. Sample cuisine from around the world in our richly cultural border city. We have even allowed time for you to tell us what you want to see or do!